The employee saw his job being advertised after he hurt his back at work. 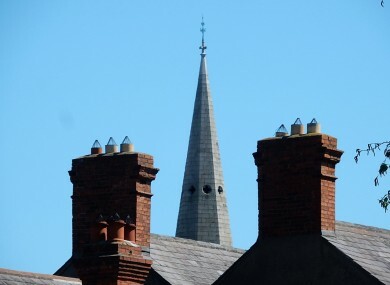 A WORKER WHO was told to ‘wing it’ when doing installation work with no harness on a church steeple has been awarded €10,000 for being unfairly dismissed. The Workplace Relations Commission was told that the man later suffered a back injury while carrying out work on a scaffold in Blackrock in Dublin without the safety equipment. The complainant, who wasn’t named in the anonymised judgement from the commission, was hired to make digital prints and then fit the products to vehicles or buildings. If the job required two people, then the complainant was accompanied by the respondent – whose name was also removed from the published decision - otherwise he went on his own. The complainant told a commission hearing in Dublin that he applied for a position on the FÁS jobseekers site and was hired to work for 37.5 hours across five days a week. He said he was on-site in September 2015 in Belfast and was “required to work at heights without a harness”. The worker also said that he was expected to use a cherry picker at the site despite not owning a licence to operate one. The complainant started work at 7am and did not finish until 9pm, with just a 30-minute break for lunch, the commission heard. That same month the complainant said he was expected to work on a church steeple and was told to ‘wing it’ when he wasn’t provided with a safety harness. In November 2015, while working on a mobile scaffold in Blackrock, Dublin, the employee said he again was not provided with a harness. The complainant injured his back and he was on certified sick leave for nine days but was not paid. The complainant said that while out on sick leave he saw his job being advertised. When he raised this with his employer, the ad was removed. In July 2016, the employee was back on the job when he said he was asked to work at a height of 15m without a harness. Believing the situation was a health-and-safety risk, the worker said he left the job site. He later made a formal complaint to his employer but left a meeting after 15 minutes after being abused for not completing the job, the commission was told. The complainant said he was constructively dismissed and had not worked since. The officer who heard the case, Rosaleen Glackin, said that she found the complaint was “well founded” based on the uncontested evidence. The respondent didn’t attend the hearing. Glackin directed the respondent to pay the worker €10,000 within 42 days of the ruling. Email “Worker gets €10k after being told to 'wing it' on a steeple with no harness”. Feedback on “Worker gets €10k after being told to 'wing it' on a steeple with no harness”.